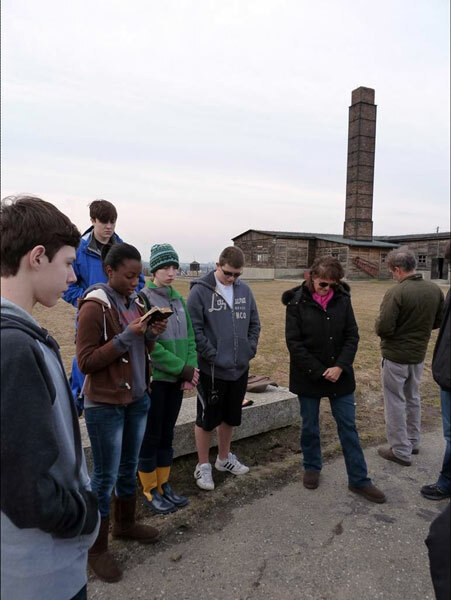 Students from Newark Academy, during their March trip to Holocaust sites in Poland and Prague, read memorial passages outside the crematorium at the Majdanek concentration camp. Before Chantelle Westlock of Hillside went to Eastern Europe in March what little she knew about the Holocaust came from fictional films like Inglourious Basterds. It was a trip to the Majdanek concentration camp in Poland that brought the full horror of the Holocaust into focus for her. 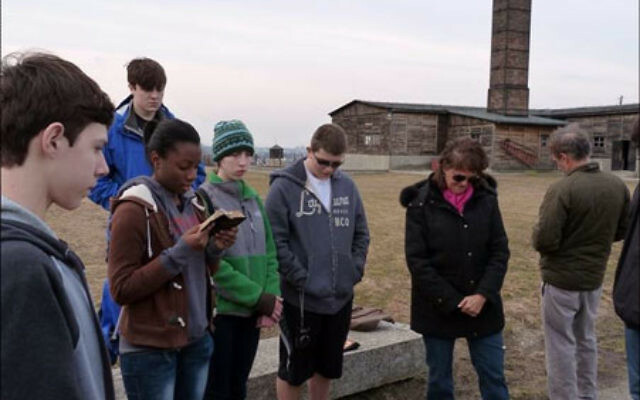 “The first crematorium we saw was at Majdanek,” said Westlock, a junior at Newark Academy. “Outside there was a big memorial full of real ashes from people who had died. We went inside, and I couldn’t take it, thinking about the people being put into ovens. Westlock, who is not Jewish, visited Holocaust sites in Poland and Prague during a March break trip organized by Sam Goldfischer of West Orange, Newark Academy’s business and finance director, and Amy Schottland, a member of the humanities faculty. Twelve students, in grades 10-12, departed March 3 and returned March 19. They visited old synagogues, the site of the Warsaw Ghetto, Oskar Schindler’s factory, forests where Jews were murdered, and concentration camps and death camps, including Auschwitz-Birkenau, Treblinka, Majdanek, and Theresienstadt. It was a fully immersive experience at a private school where, unlike New Jersey’s public schools, Holocaust studies are not a required part of the curriculum. And because the trip included Jews and non-Jews, it was an opportunity for a reporter from a Jewish newspaper to meet with the students on April 6 and discuss how the Shoa is being taught and absorbed outside of Jewish auspices. The Scotch Plains resident said their group met a group of Israeli kids, who were “shocked that non-Jewish kids were seeing the camps. But they respected us and appreciated us,” she said. In the end, however, Nate said he appreciated going with peers. “Spending time with kids my age and being able to talk with them was a good experience,” he said. Others found they learned more than they had expected. Livingston resident Steven Wilf’s grandparents survived the Holocaust. Several of the students said they were disturbed by an attitude among Poles that emerged through several interactions, suggesting that little has changed over the intervening decades. “I thought a lot of aspects of Poland were appalling,” said Jacob Zack, a senior from New Providence. He described the memorial just outside Birkenau featuring an actual train car. Daniel recalled an incident in Lublin. But at a museum of children’s drawings outside Theresienstadt, Annie Tvetenstrand, a junior from Summit, said, she suddenly gained some insight. Annie, in a written reflection, responded to the Israeli teens who were so surprised that non-Jewish kids were visiting Holocaust sites. And according to Goldfischer, the trip had an impact on the entire student body.